When Enrico Salvo founded Carmichael International Service (CIS) in the early 1960s’s, the Port of Los Angeles was well on its way to becoming one of the nation’s busiest seaports. Salvo – along with his two sons – is still at the helm of the customs brokerage company he founded 53 years ago, managing 245 employees in 13 offices around the United States. As the company grew, so did their data requirements. 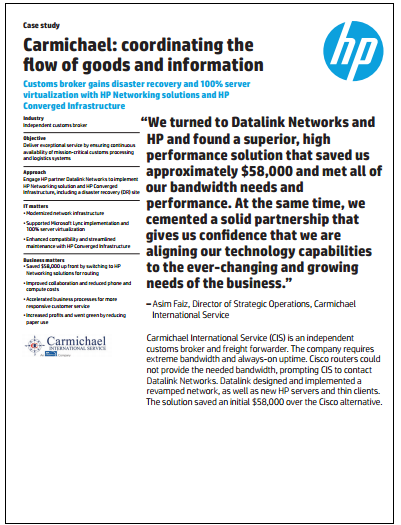 “We reached out to Datalink Networks to completely redesign the whole network,” says CIS co-President Vincent Salvo. © 2019 Datalink Networks, Inc.